HARTFORD — All proposals for new laws in the State of Connecticut were due to legislative leaders on Friday, January 18th. 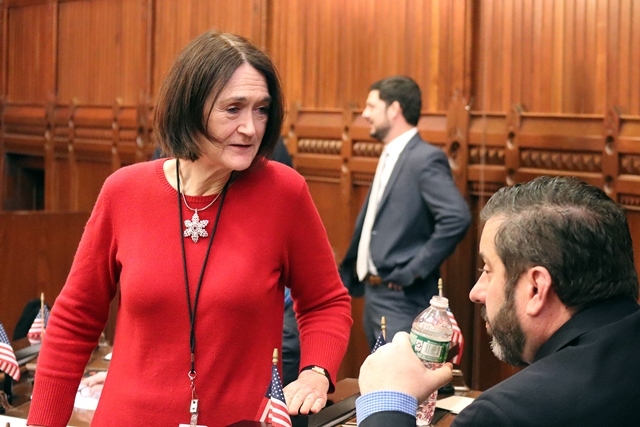 State Representative Holly Cheeseman (R-37) submitted a few bills that would protect Connecticut taxpayers, save them money, and reduce the reach and inefficiencies of our government. All bill proposals in the General Assembly are considered by legislative committees, and potentially brought to a public hearing, before being raised to the House and Senate for a vote. To read more about the bills that Rep. Cheeseman has proposed or co-sponsored this session, visit her website at www.repcheeseman.com and click on the “Legislation” tab. If you are interested in sharing your opinion on a bill, information on how to testify at a hearing or via email is available at www.cga.ct.gov. Rep. Cheeseman proposed House Bill (H.B.) 5703, which would allow consumers to be able to use cash as payment in Connecticut businesses. This bill has been referred to the General Law Committee, on which Rep. Cheeseman serves as the lead House Republican. Email testimony to gltestimony@cga.ct.gov. H.B. 5576: To create a jobs initiative to attract and retain a quality workforce using return-on-investment strategies. HB 5369: To reduce the processing time of workers’ compensation claims filed by members of the National Guard, thereby expediting payment of benefits, and provide assistance in filing such claims. House Joint Resolution (H.J.) 1: To provide protection from governmental intrusion through a state constitutional amendment that establishes an individual’s right to live free from governmental intrusion in private or personal information as natural, essential and inherent. HB 5006: To remove mileage reimbursement from legislator’s base salaries for pension calculations. HB 5039: To increase transparency in lobbyist efforts to influence legislators on issues. HB 5112: To limit the grant of funds under the Citizens’ Election Program to only those candidate committees of candidates who have opponents. Senate Bill (S.B.) 11: To eliminate the requirement for approval by the Secretary of the United States Department of the Interior regarding the operation of a casino gaming facility in East Windsor by the Mashantucket Pequot Tribe and the Mohegan Tribe of Indians of Connecticut, encourage business development and job retention and growth, and increase revenue to the state. S.B. 17: To provide for additional revenues and jobs from the operation of sports wagering, Internet gambling and Internet Keno; enhance the revenue to the state from agreements between the state and federally recognized Indian tribes in Connecticut; ensure that Connecticut’s gaming and tourism industries remain competitive with those in surrounding states; and ensure age and physical location verification for participation in Internet gaming. For more information on these bills, including which committee to submit testimony to, go to www.cga.ct.gov. In the “Quick Bill Search” bar at the bottom of the page, type in the bill number and click “Go.” For contact information for a specific Committee, from the homepage click the “Committees” tab at the top and then select that committee.